When it was first published in 1994, Women’s Bodies, Women’s Wisdom quickly became an international bestseller, and it has remained the veritable bible of women’s health. "I recommend "Women's Bodies, Women's Wisdom to all women and also to all men who want to understand and nourish the women in their lives." "A masterpiece for every woman who has an interest in her body, her mind and her soul." ""Women's Bodies, Women's Wisdom is a gateway to the deepest understanding of health and well-being." "This book demonstrates the reemergence of the feminine in healing, a force that has kept the inner pulse of healing beating for centuries. If you can't have Dr. Northrup for your doctor, read her book." "I recommend "Women's Bodies, Women's Wisdom" to all women and also to all men who want to understand and nourish the women in their lives." --Deepak Chopra, M.D., author of "Ageless Body, Timeless Mind"
--Caroline Myss, Ph.D., author of "Anatomy of the Spirit"
""Women's Bodies, Women's Wisdom" is a gateway to the deepest understanding of health and well-being." --Joan Borysenko, Ph.D., author of "Minding the Body, Mending the Mind" and "A Woman's Book of Life"
--Larry Dossey, M.D., author of "Healing Words" and "Meaning & Medicine"
" I recommend Women's Bodies, Women's Wisdom to all women and also to all men who want to understand and nourish the women in their lives." -- Deepak Chopra, M.D., author of "Ageless Body, Timeless Mind"
" A masterpiece for every woman who has an interest in her body, her mind and her soul." -- Caroline Myss, Ph.D., author of "Anatomy of the Spirit"
" Women's Bodies, Women's Wisdom is a gateway to the deepest understanding of health and well-being." -- Joan Borysenko, Ph.D., author of Minding the Body, Mending the Mind and "A Woman's Book of Life"
" This book demonstrates the reemergence of the feminine in healing, a force that has kept the inner pulse of healing beating for centuries. If you can't have Dr. Northrup for your doctor, read her book." -- Larry Dossey, M.D., author of "Healing Words" and "Meaning & Medicine"
"I recommend Women's Bodies, Women's Wisdom to all women and also to all men who want to understand and nourish the women in their lives." --Deepak Chopra, M.D., author of "Ageless Body, Timeless Mind"
"A masterpiece for every woman who has an interest in her body, her mind and her soul." --Caroline Myss, Ph.D., author of "Anatomy of the Spirit"
"Women's Bodies, Women's Wisdom is a gateway to the deepest understanding of health and well-being." --Joan Borysenko, Ph.D., author of "Minding the Body, Mending the Mind" and "A Woman's Book of Life"
"This book demonstrates the reemergence of the feminine in healing, a force that has kept the inner pulse of healing beating for centuries. If you can't have Dr. Northrup for your doctor, read her book." --Larry Dossey, M.D., author of "Healing Words" and "Meaning & Medicine"
Christiane Northrup, M.D., is also the author of the #1 New York Times bestseller The Wisdom of Menopause and Mother-Daughter Wisdom, and the host of seven public television specials. A board-certified OB/GYN and past president of the American Holistic Medical Association with more than twenty years of clinical and medical teaching experience, Dr. Northrup was a pioneer in the partnership between conventional and complementary medicine. Her work has been featured on The Oprah Winfrey Show, Today, and Good Morning America, among many others. She lives in Maine and is the mother of two adult daughters. Haven't fully indulged in it yet, but looking good! I really appreciate Christiane Northrup, M.D. and this is not the first book I've bought from her. She is a woman's doctor and has a lot of knowledge about how the female anatomy works. I like that she isn't totally medical model and also talks about herbs and other alternative methods to use in healing. First!!! Please make sure you are looking at the new 2010 edition with the White cover and standing photo of Dr. Northrup. Amazon is posting all the reviews to ALL the editions! You can reach the other book by clicking on the above link that says which version this review refers too. It is also important to look at the dates on the reviews when considering them. Many of them are 10 or more years old. Not only has the over 900 pages of information been significantly updated, but attitudes towards its content have changed dramatically since it was first published. Back in 1994 when the first edition was published, the idea that the mind could control the body was something contemplated mostly by "New Agers" and anthropologists studying Amazonian tribes. Ten years earlier Louise Hay's, "You Can Heal Your Life" had introduced the idea with a non-scientific book based mainly on personal experience. The 90's opened the door further when medical doctors like Deepak Chopra and Bernie Siegel, aided by medical researcher and journalist Norman Cousins, began to talk about the clinical evidence for a mind/body connection and how it could be manipulated. They had some incredible stories to tell, but it wasn't until Dr. Northrup came along that a board certified OB/GYN started to connect the psychological, spiritual and medical dots that led to health or ill-health for women. Our Bodies Ourselves, first published in the early 1970's had been the first book to openly insist that women take control of their bodies, but it was still more a manual for working "with" a largely authoritarian and at times misogynistic medical community. Later editions become more focused on the culture of younger women. 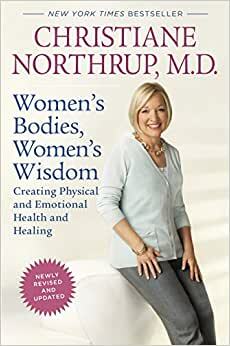 Dr. Northrup's book is perhaps the graduate course for OBO, fusing cradle to grave medical advice for women with support for dealing with the impact of culture, self-worth issues and spiritual beliefs on a woman's health. It provides guidance in creating positive, health affirming outcomes rather than viewing the female body from the medical model of diseases waiting to happen. Take a look at the table of contents available in the "Look Inside" guide. While a large portion of the book is dedicated to discussing issues affecting a woman's body from the menstrual cycle through menopause, the rest of the book focuses largely on wellness, including affirmations designed to "protect and serve" the body rather than "cut and control" it. This makes the book not only a valuable reference manual for those times when things go wrong, but an encyclopedia of protective spiritual wisdom from someone who is an expert on both women's bodies and their spirits. In many ways this book is still ahead of its time, which makes it a good buy for the present and the future. Have read and applied Dr Christiane Northrup's book Women's Bodies Women's Wisdom for many years. This book has explained questions I had throughout my childbearing and mothering years. As our bodies and hormones change, often times we need a holistic answer why. This book is that source of information. I now have experienced menopause and Dr Northrup's book Wisdom of Menapause was my only resource. I thank Dr Christiane Northrup with great respect. I am now buying this book for my daughters with much confidence it will bring all the wisdom for them as they are experiencing womanhood! This is one of my favorite books, the type of book I can't put down. Lots of information on how to be healthy, happy, and in tune with one's femininity.